Students practice spelling words in groups with similar word patterns using the “Words Their Way” program. Letter formation and spacing, grammar skills, punctuation, capitalization, compound words and contractions are introduced and practiced. The students work on writing the four different types of sentences, declarative, interrogative, exclamatory, and imperative in daily writing assignments and journal entries. In Writing Workshop, students begin writing personal narratives, fiction and nonfiction, and poetry. Dictionary and library use are introduced. Reading Workshop develops reading comprehension skills allowing students to spend an extended amount of time reading authentic texts that interest them on a daily basis. Student learn reading strategies and embrace opportunities to talk about literature. 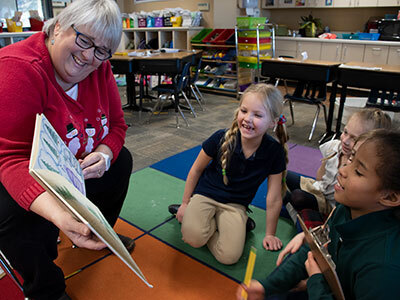 The ultimate goal of a Reading Workshop is to develop life-long passionate readers who can read a variety of texts that have increasing levels of complexity. Through the introduction to the Singapore Math program, students learn to read and write numbers to 100, count by 2s, 3s, 5s and 10s to 100, and add and subtract two-digit numbers to 100. Other topics include time, money, basic fractions, and multiplication and division of 2s, 5s and 10s. Word problems and methods of solving them are an integral part of the program. Students in first grade practice the process of science with an emphasis on predicting and recording their observations. Students utilize the campus environment to study aquatic habitats and create desktop ponds to observe the interactions of fish, insect larvae, and plants. Students compare and contrast these freshwater systems to salt water environments. Additionally, students explore the solar system, particularly comparing earth to sun, learning about the earth’s rotation, revolution and tilt. Students investigate food groups and the importance of good nutrition. The first grade curriculum includes World and American History. Geography is embedded throughout the various units of study. World studies begin with the Ice Age progressing through early civilizations including Mesopotamia and Egypt. North American history advances from hunters and nomads crossing the land bridge from Asia to North America to a look at the Maya, Inca, and Aztec civilizations. Focus then shifts to early exploration and settlement examining the Conquistadors, English settlers, and the American thirteen colonies. Students are able to demonstrate knowledge through numerous public speaking opportunities centered on global awareness and current events. The goal of the Spanish program is communicative competence in speaking, listening, reading, and writing. Emphasis on building vocabulary through children’s poetry, songs, role playing, games, and stories addresses topics such as greetings, expressions of emotions, people and things in the classroom, numbers, colors, days of the week, body parts, animals, states of being, family, weather, months, clothes, rooms in the school, traffic safety, transportation, places to go, and summer activities. Throughout the year students experience the traditions of various cultures and regions of the Spanish speaking world through units on Cinco de Mayo, Día de los Muertos, and Christmas celebrations. First grade uses the book “Viva el Español” System A. In first grade, students begin weekly piano lessons, applying and reinforcing music concepts learned in classroom music including rhythm, pitch, and spacial relationships. Students learn to set goals and develop beginning performance skills as they prepare for their first piano recital. Singing in a group and alone, through movement exploration, and playing instruments, students establish critical musical experiences that lead to a meaningful understanding of beginning musical notation. Unison choral singing in choir also prepares students to work collectively to perform in two concerts, and for assemblies on Grandparents Day, for Fine Arts Week, and during other special events. Students enjoy being introduced to the instruments of the orchestra as they hear and learn about the four instrument families and are exposed to a variety of orchestral music. 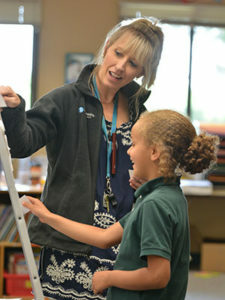 Students learn basic drawing, painting, and sculpture. They discover color properties and observe the interplay between color and light and bright and dark colors. Students also examine and discuss works of art, including various genres such as portraits and still-lifes. After studying some of the art “Isms” including Impressionism through Monet and Cezanne, they then create a piece in the style of one of the artists. The program emphasizes physical skills that can be applied in multiple sports situations. Through games and drills, students learn basic skill development, fine and gross motor movements, spatial awareness and basic strategy. They develop confidence and motivation to participate in organized and individual physical activities and learn leadership, teamwork, and good sportsmanship while emphasizing lifelong fitness.